Who doesn’t love a good oatmeal raisin cookie!? I sure do but I don’t love the loads of sugar and butter they were most likely made with. The solution? 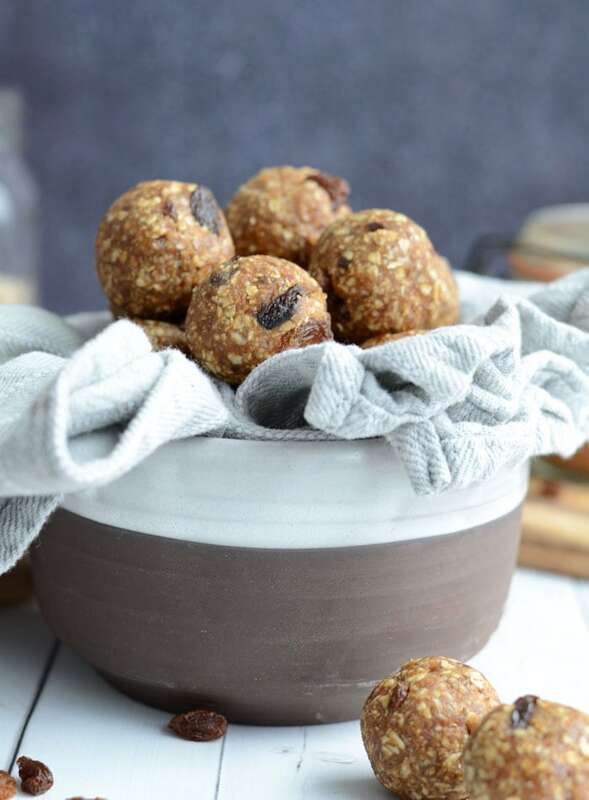 Raw vegan oatmeal raisin cookie dough bites! 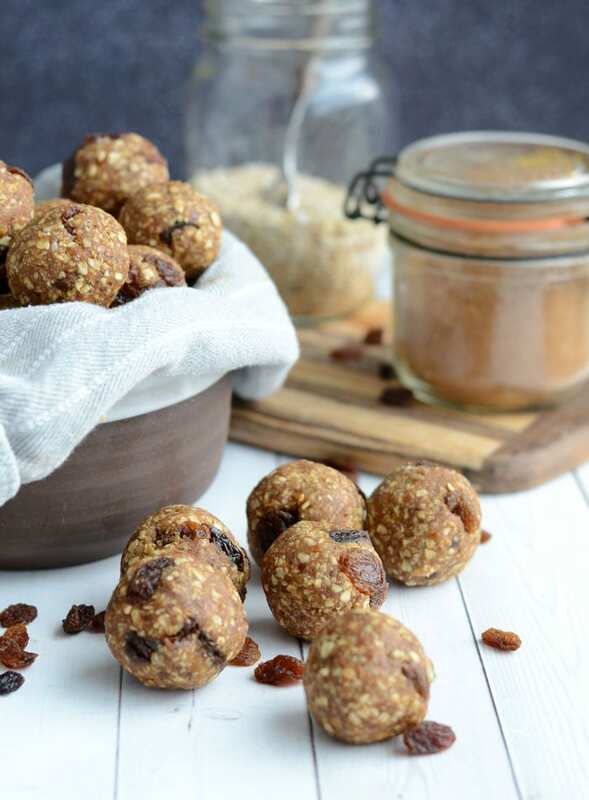 These oatmeal raisin cookie dough bites are a perfect pre-workout snack due to the natural sugars from the raisins and dates, plus carbs from the oats and a dose of healthy fats from the almond butter. They’ll provide a wonderful boost of all-natural energy and whether it’s before a workout or as an afternoon snack, it will be tasty either way! I go to the gym early in the morning and I don’t usually feel like eating much at 5 am. I love keeping no-bake bites in the fridge just for this purpose! 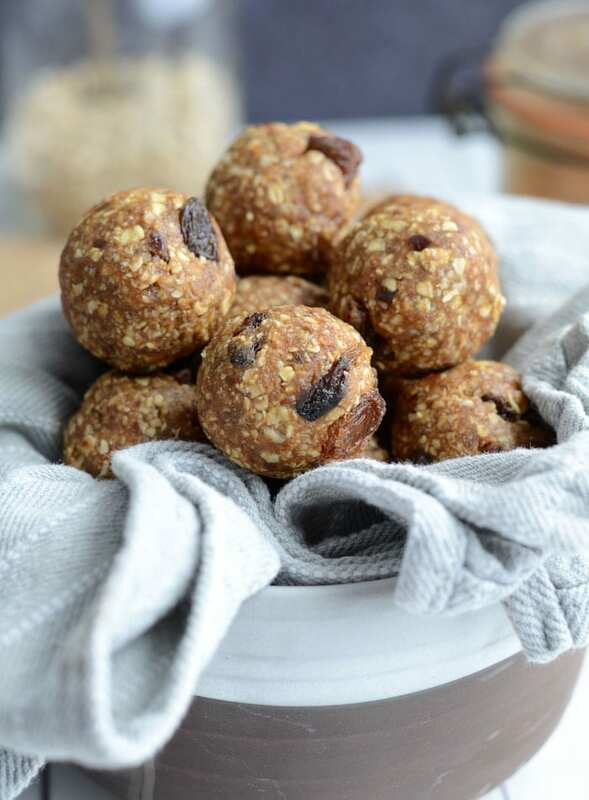 These cookie dough balls are easy to grab and hit the road, they taste great and they have everything I need to fuel me up for a good training session. Plus that 4:45 am alarm clock isn’t so bad when I know I’m minutes away from popping a few of these. These cookie dough bites are made with simple ingredients you most likely have on hand already. They taste just like a batch of oatmeal raisin cookie dough: addictive, delicious, sweet with hints of vanilla, cinnamon and sea salt. 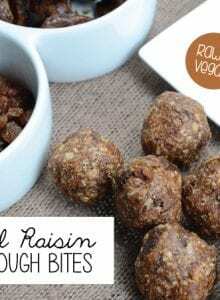 They’re super easy to make too, just blend up the ingredients, roll into balls and you’re done! 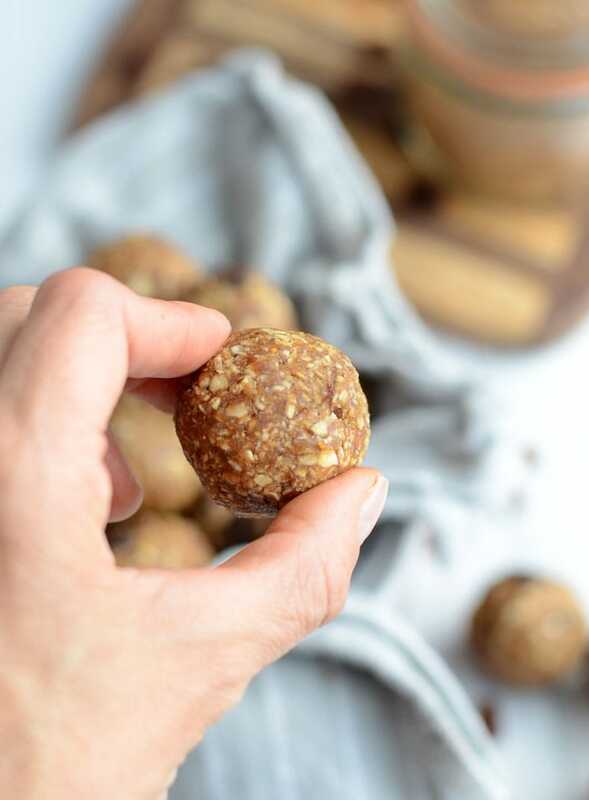 They’re healthy enough for snacking, delicious enough for dessert and nutritious enough to grab for a quick breakfast on the go. Make sure the dates are soft and moist. If you find your dates are very dried out, just soak them in hot water for about 15 minutes before draining and using in the recipe. I like medjool dates the best for recipes but neglect dates are also a good choice. I can usually find fresh, soft dates at my local grocery store but if you can’t find any, you can either order dates online or soak dry dates before using. What Nut Butter Is Best? Preferably, you’ll want to use almond butter that is quite runny with a lot natural oils, if it’s too dry the balls won’t stick together. I used the Organic Almond Butter from Nuts to You Nut Butters and it worked perfectly. You can substitute the almond butter with another nut butter but I find peanut butter to be quite overpowering in this recipe so I prefer to make them with almond butter. Almond butter compliments the oatmeal raisin flavour nicely whereas the peanut butter turns it into peanut butter oatmeal raisin cookie dough, which is also awesome it’s just a different flavour. Up to you! Cashew butter or sunflower seed butter would also be suitable. What If My Dough Isn’t Sticking Together? If your dough isn’t sticking together, use wet hands to roll the bites or add 1 tsp of water at a time to the dough until it does. I found using wetted hands to really mix everything together worked great and I didn’t need to add any additional water. If you’re dates and/or nut butter was too dry, you might need a bit of water to roll them up. No Food Processor or Blender? I use my food processor or blender to mix up the dough but you can also just add all the ingredients to a bowl and work it together with your hands. Keep kneading it together until it forms a thick dough, then roll into balls. This is a little more work but at least using your hands means no food processor parts to clean! Add everything except the raisins to a food processor and mix until mostly smooth. Remove and place in a bowl. Add the raisins and mix in with your hands. Roll into approximately 25 balls. Store in the fridge or freezer in an air-tight container. They save the day when I come home starving from work but dinner won’t be ready for an hour or two! These look awesome. And gluten free to boot! I have all the ingredients, so I think this will be my Saturday project. These taste great! Perfect for an afternoon snack, will definitely will be making these again. Thank you! That’s great! Thank you so much for letting me know! I made these earlier, and we all loved them! 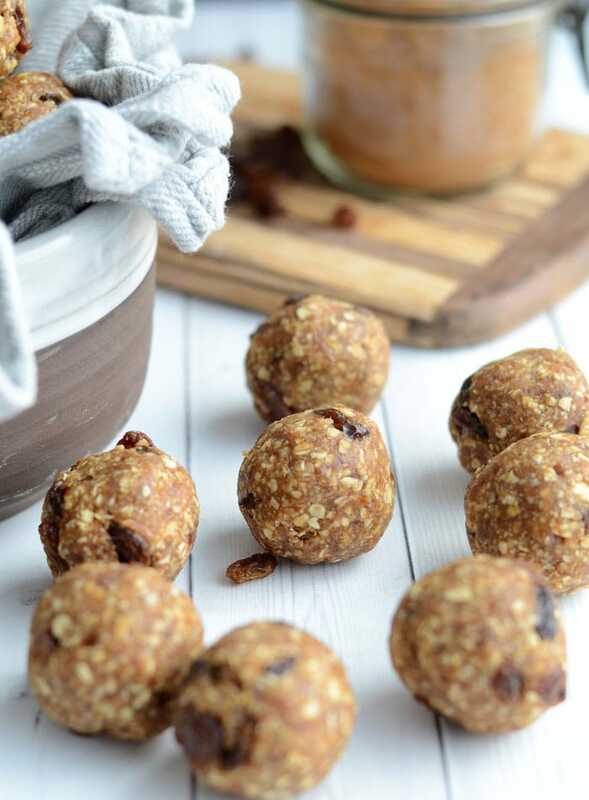 These oatmeal cookie balls are looking delicious. Easter is coming and I will try eggs like that like easter eggs for my children! Great Post. These look awesome 🙂 Do you have any idea or an estimation of how many calories and grams of fat per bite? That is so wonderful to hear! Great sub idea too 🙂 So glad you enjoyed them!! 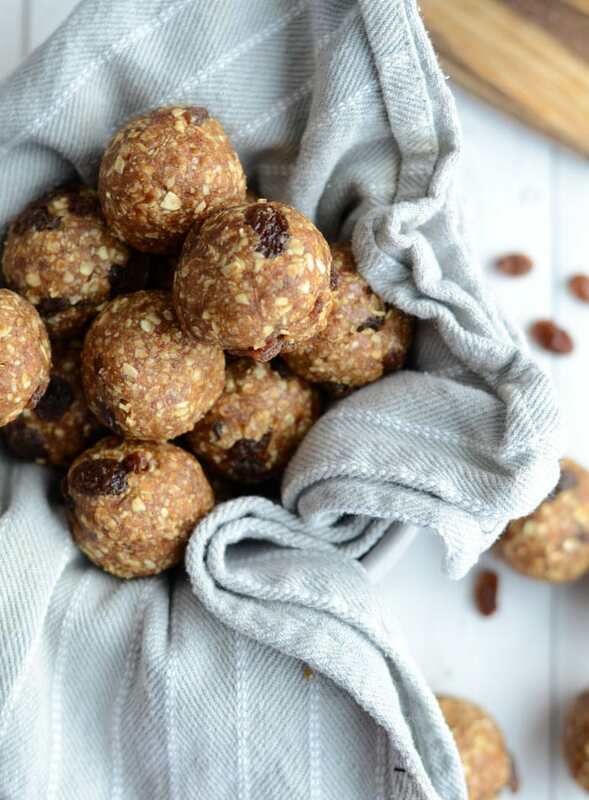 I found this site while looking for a healthy raw desert alternative – coming across this recipe made me so happy since it is so easy to make, great for before my running/exercise, and cuts my cravings for sweets!! I am currently on a super strict diet, trying to loose a few pounds…I have tried to use a few different sites/apps to calculate the calories and I haven’t yet been able to. If anyone can come up with them please let me know!!!! I make the recipe exactly as instructed although without a food processor and with less raisins 🙂 very yummy! Thank you!! 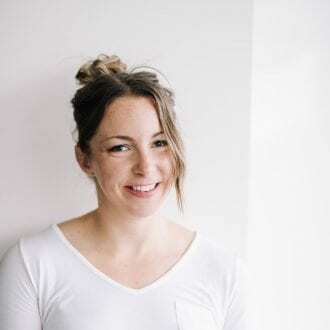 Hi Megan, I’m so glad you are enjoying my site and recipes! I couldn’t recommend anytime for calculating the calories, apologies, it’s just not something I watch. I hope you can find something to figure it out! The only one I know of is My Fitness Pal. Thanks for the comment! These look great, and I’m about to make them for a vegan colleague in the UK. I have two questions, though: how big is your ‘cup’ (or does it even matter, as long as you use the same one?) and what do you mean by ‘vanilla’ – essence? Thanks! These are fabulous! First time I subbed anything in this recipe and used a combo of sunbutter and walnut butter and added flax, still delicious. My 3 year old is hooked too! Thanks for all of your quick bite recipes ???? I never tried this type of cookie and thank you for sharing these recipes. My family would love this if i will cook like this. They love cookie very much. I see that the recipe wasn’t that much expensive but it result to a very tasteful cookie if we do it properly. This recipe is amazing! I add walnuts and vegan chocolate chips and it tastes like heaven! Thanks for your comment, it reminded me I need to make these again asap!